cardigans and kids: our favorite garden vegetable. Or at least, Mat and my favorite. Fresh tomatoes - I wait for them for BLT's and he waits for them for salsa. We have enjoyed both this last week. Until finding The Splendid Table's How to Eat Supper: Recipes, Stories, and Opinions from Public Radio's Award-Winning Food Show by Lynne Rossetto Kasper and Sally Swift, I had no idea that there could be such a difference in tomatoes. 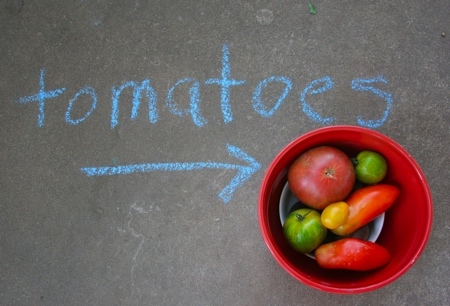 I knew that I liked roma tomatoes because they didn't seem as acidic and that was about it. And then I learned all kinds of things such as tomatoes not only have different levels of acidity, but also of sweetness and richness. Some of my favorites to grow are amish paste, Nebraska wedding, striped green and yellow and I can't leave out Black Krim. I'm guessing all can be found at the farmers market (our CSA is how I found out I like the striped varieties). If if your in the midwest, and your garden is like mine, this is the right time for tomatoes.